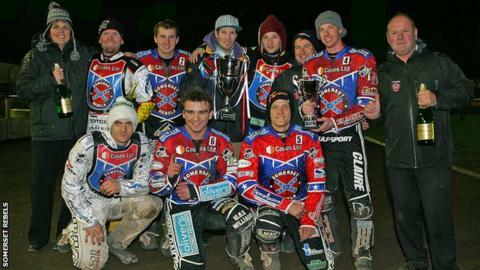 Somerset Rebels beat Ipswich 95-90 on aggregate to win the Premier League Cup for the first time in their history. Ipswich Witches won Thursday's second leg 51-42 but it was not enough to overturn the Rebels' 14-point lead from the first leg at the Oaktree Arena. "We've had some battles with them this year and that was the hardest one," Somerset promoter Debbie Hancock told BBC Somerset. "We're so pleased for everybody. The boys were fantastic." Somerset relied heavily on number one Craig Cook, who picked up 15 points, while Morten Risager top scored for Ipswich with 11. The hosts were leading by 12 points after heat 10. But the crucial moment came in heat 13, when Somerset's Claus Vissing was disqualified for flooring Leigh Lanham and Rohan Tungate - the re-run finished 3-3 and stunted Ipswich's chance of turning around the aggregate deficit. Witches team manager Pete Simmons told BBC Radio Suffolk: "It looked good at one stage until the carnage in heat 13. I'm not very pleased about it at all. Claus Vissing came up on the outside from nowhere and wiped my two boys out. That's totally unacceptable." Ipswich still have the opportunity to take some silverware as they host Newcastle in the first leg of the Knock Out Cup final on Saturday with the return meeting on Sunday. "If we ride like this against Newcastle I'll be reasonably happy," said Simmons. "We just need a bit of luck." Somerset will now turn their attention to their Premier League play-off final double header against Scunthorpe, which starts on Friday. "It goes to prove how much they want to win this weekend - they didn't even crack open the champagne," added Hancock. "They've put it on ice and said they would have it on Sunday. "They need to grab points tonight to take a big advantage up to Scunthorpe."